Trouble Getting Approved in Kentucky? Summary of Kentucky Usury Law(s) / Quote: "Legal: 8% / Contract: 4.5% on loans $15,000 or less; 1.5% on bank & trust company loans of $15,000 or less; others any rate / Judgment: 12% / Corporate: No specific rate"
Legal Maximum Interest Rates: Quote: "The max legal interest rate in Kentucky is 8 percent unless there’s an agreement otherwise. Even then, parties can’t agree to a rate more than 4 percent higher than the Fed rate or 19 percent, or whatever is less, for a amount of $15K or less, or any rate for a loan of $15K or more as provided by the contract"
Usury Penalties: Quote: "Knowingly charging an interest rate greater than the law permits forfeits the entire interest of the debt, in addition, the borrower may recover twice the amount of interest he or she has paid"
Judgment Interest Rates: Quote: "Generally, the interest rate on court judgments is 12 percent. However, if the obligation came from a written contract specifying a different interest rate, then contract rate applies, whether it’s lower or higher"
Legal Exceptions: Quote: "Banks can charge a min loan fee of ten dollars, even if the legal interest would be less. Credit unions cannot charge more than 2 percent per month on overdue balances, and they can’t lend to any member a loan worth more than 10 percent of the credit union’s capital"
Jeanne is moving to take a new job so she can be closer to work and spend a lot less time commuting. Her new job actually pays her more than she is currently making, however the commuting cost was going to eat up all of the extra income she was going to be making. Jeanne does not have any emergency savings set aside and she also only has one credit card with a thousand dollar limit. She wants to borrow $2000 and repay the loan over a period of two years, although she is hoping to repay it much quicker than that. Jeanne needs some money to pay for the deposit she is making on the new rental apartment and the moving expenses. She will probably need to buy a few things to be more comfortable in her new place, but until she gets there she is not sure just what she needs and how much she will spend. She likes to manage her money and not overspend. She actually thinks that she will only need about $1200, so the extra $800 is just insurance for anything that she needs for extras. If she can make all of this work, she will be making more money, live closer to work which reduces her commuting costs and be in a new apartment that she will enjoy a lot more than the current one. The new one is in a brand new building so no one has ever lived in the apartment before. Jeanne is really looking forward to her new place. She just needs this loan approved so she can reserve it. The $88 monthly payment she will pay on this loan is actually less than the cost of commuting that she is currently paying for gas and repairs on her car. This move will actually save her a great deal of money each month. She should really take the money she is saving by moving and put it into a savings account to pay expenses for emergencies and other special needs she may have from time to time. She is a good credit risk and Jeanne should be approved for the loan she is asking for with no problems. The money can be in her checking account within a few days, however once it is approved she can commit to the new apartment, give notice on her existing one and hire a moving company to help her move. She is also thinking of asking some of her friends to help her move which would save her a little money. She would have to pay for the rental truck and of course the beer and pizza for everyone. Jeanne seems to have everything organized and is really excited about moving to her new apartment and spending a lot less hours on the road commuting to work. 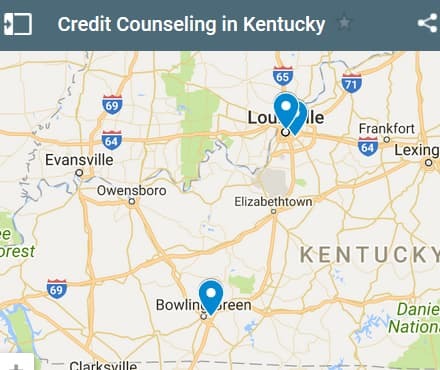 If you live in the State of Kentucky and you're struggling to get a loan approval with a bad credit rating we hope our website helps you in some way. 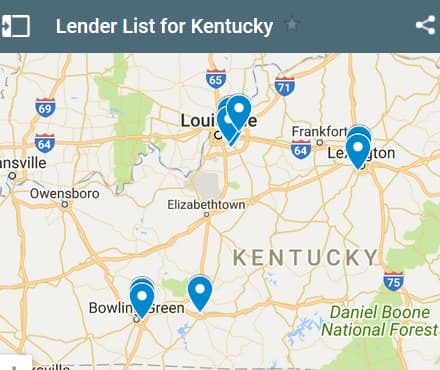 Last 5 debt service loans approved in the State of Kentucky. Source: WFL Lender Pool. Updated Weekly. Principals rounded to the nearest $1000. Relative interest rates listed below in order left to right. Any Kentucky lender can approve a loan with a lower rate than what your current debts carry, but your credit score will dictate what your new rate will be. Don't bother getting a loan for the purpose of consolidation other debt unless the rate of the new loan is well below your current balances. Also, make sure you read the loan agreement thoroughly before signing into a contract agreement. David’s daughter is in the hospital and he feels that the amount he will owe the hospital along with his other bills is going to be just too much for him to deal with this month. He would like a debt consolidation loan to help him deal with the medical bills and his ongoing credit card bills that he is dealing with. In total he will owe about $7500 for the medical bills and the credit card balance he is dealing with. He would like to repay the loan over a three year term. He has two credit cards each with a $1000 approval limit. He could have a higher credit limit but each time the credit card company have offered him a higher limit he has declined. He is afraid of suddenly finding that he owes too much money and does not want to risk paying high interest rates on the balances. Currently he owes $2000, but has enough cash to pay the balance in full, however he is worried about the medical bills he is about to receive. David’s daughter is in the hospital for day surgery. He does not know what the final cost will be, however it is estimated between $4500 and $5500 in total depending on how well the operation goes and what they find. He has health insurance; however, the deductible is $6000. He chose this high deductible to lower is monthly payments. He did not expect to have to deal with this kind of health issue. If he is approved for this loan, he will have a little extra to cover any added expenses that may be required. If the estimate is good and they do not go over the high number of $5500, he will be able to immediately repay $2000, which will reduce his interest cost and also his term of the loan. David is taking the right approach when it comes to medical costs. He is ensuring that he has enough money to pay his fees up to the deduction limit. He has a good credit rating and this loan will ensure that he maintains that level by not missing any payments or carrying a credit card balance for a longer period. David should have no problem being approved for the loan. In fact, he could borrow more if needed based on his income level and his credit rating. He should also set aside more funds to deal with future emergencies instead of looking for a loan each time. That is for the future, right now we wish him and his daughter the best of luck while they deal with this medical emergency. He is thinking ahead and trying to make sure that he can pay all of his debts on time. 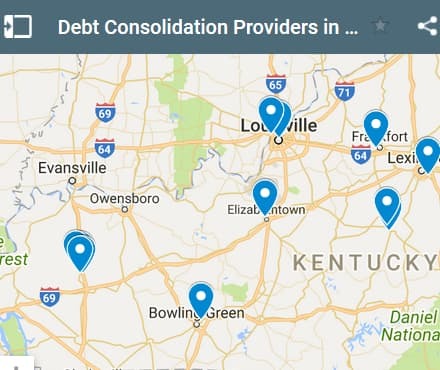 If you live in the State of Kentucky and you're trying to get approved for a debt consolidation loan, we hope our website helps you find a good lender regardless of your credit rating.